To assemble an Elfa freestanding solution, one Stabilization Kit is required for each section. Available only at The Container Store, the Stabilization Kit includes a Stabilization Bar, two Crossbraces, two End Caps and one Center Cap. It provides the necessary lateral support for Elfa freestanding Uprights. Platinum Elfa freestanding Stabilization Kit is rated 4.7 out of 5 by 15. Rated 5 out of 5 by scrapcrafter from love elfa freesanding I purchased an elfa freestanding system for my craft supplies since I only had space in front of windows. It works beautifully and now after using it for awhile I know that it is not going to tip no matter how much weight I have in the drawers. Also I was able to put it together myself without any help from my husband - just remember to start putting the shelves/drawers in from the bottom up. Love the clean look! Rated 5 out of 5 by CPADallas from Free-standing Credenza We have tons of Elfa throughout our house (and garage), but have never tried the free-standing components. After researching numerous solutions for a very specific size credenza behind my home-office desk, I discovered that Elfa free-standing components were the perfect answer! Easy to assemble, and very solid. Rated 5 out of 5 by Pileatedwoodpecker from Great Purchase! I had seen the elfa Freestanding shelves online, but was concerned that they might not be very stable. I went to a Container Store to look at them in person, and was very satisfied that they are extremely stable! If you are shopping online and are uncertain about the stability of elfa Freestanding, don't be! Go ahead and order them online, and you will be very happy with your purchase! Rated 5 out of 5 by Anonymous from Elfa shelves are a great solution Elfa shelves are great. Kind of addicting... Once you get to know them it seems you find always a new place in your home that can use them to help you get organized. About this specific piece, the stabilization kit, TCS offers it only in two sizes, 2" and 3". I have freestandings of both sizes at home and based on my experience, I think TCS should offer them in at least two other sizes, 1.5" and 2.5". The 1.5" would be great to make a more sturdy 3" wide freestanding with an extra support in the center (you should not store very heavy stuff in a 3" wide freestanding shelf, especially if using ventilated shelves), and the 2.5" would be good as an optional extra width. It doesn't look like much but the difference between 2" and 3" can be significant. My 2" freestanding is in a place that could use half a foot more width and cannot fit a 3" wide freestanding, but I had to settle with the 2" width. Considering my freestanding has six shelves each, half a foot more width in all of those shelves would have added some welcome shelving area (although it would also make the ventilated shelves less sturdy). Considering we can always cut the shelves in widths as needed, we just need more options of the stabilization kit to be able to have more possibilities for the freestanding. I know I can have all the possibilities I can imagine using the Easy Hang solution but in some situations I prefer the freestandings. Rated 4 out of 5 by wellorganized from An absolute necessity for elfa freestanding These stabilization kits provide the necessary rigidity for the tall elfa freestanding units. Rated 5 out of 5 by flash from Desk Parts Definitely necessary to stabilize my customized computer desk. A little difficult to manage with 1 person, better to have another person hold while cross bar installed. One end of my cross bar was bent so would not go in easily until I straightened it out. Rated 5 out of 5 by SpecialK from Don't Forget These Definitely needed for your freestanding system; not that the Store would let you get away without purchasing them, I'm sure. Easy enough to assemble. Rated 4 out of 5 by daddysgirl77 from Necessary Component This is a very necessary component for any freestanding system. Rated 4 out of 5 by OrganizedFinn from Stabilization Bar - Weakest Component Stabilization bar is weakest component of the (otherwise) exceptional freestanding system. When attaching bar to the freestanding uprights, be sure that it is perfectly centered. If misaligned, there is danger that the "ears" will deform with a hammer tap and be very difficult to insert. Rated 4 out of 5 by LF01 from Very easy to use and does exactly what it is advertised to do. However, the plastic top caps tend to pop off. Rated 5 out of 5 by medoitmyself from great purchase with this kit the freestanding shelving unit is very sturdy!! I have 24&quot;, 25&quot; and 30&quot; Elfa solid shelves. I actually use the 24 &amp; 25&quot; ones in my freestanding solution but the 30&quot; ones I can't use with the freestanding because the holes on the bottom of the shelves are not located in the right place to secure onto the elfa brackets with the wires that you attach to the solid shelves. I reserve my 30&quot; solid shelves for use with the other Elfa solution that has a top track and hanging standards. FYI: The shorter solid shelves I believe are a better solution because, as other reviewers have also stated, they don't bow under a lot of weight like the 30s do when there's a lot of books on them. What is the difference between the 2' and 3' stabilization kits? Does it have to do with the height of the unit? or the width of the shelves? It has to do with the width of the shelves. Those widths are compatible with 2' or 3' wide ventilated shelves or decor shelves. If I'm building a freestanding shelving unit using 3' shelves and using the 62&quot; rails, how many stabalizing kits do I need? Each bay of our elfa freestanding Shelving requires one elfa freestanding Stabilization Kit. Can I make a 4 or 5 foot freestanding unit? I already own a 2 foot freestanding unit and in my new space I need a larger unit. Is it possible to combine more than one unit? How many uprights and stabilization kits would be needed? Can more than one top brace of the stabilization kit be used on an upright at the same time? (If I used only 3 uprights and 2 stabilization kits.) Or do you have to just put two separate freestanding units together? Yes, multiple units can be combined. You can add another upright, freestanding foot, and a 2' or 3' stabilization kit to extend it. I have three shelves that are 12 x 30 and were part of a wall mounted elfa system. My new apt needs a stand alone, not a wall-mount. Is the stabilization bar a fixed width? How many inches wide is it? Ideally i'd purchase two feet, two tracks and the stabilization kit and use the shelves i have. Our freestanding solution only comes in increments of 2' and 3', so it will not be able to support a 30'' solid shelf properly. If you would like assistance with creating a custom freestanding solution, please call us at 1-800-733-3532. What is the Depth and Width of the Stabiliztion Bar? The stabilization bars come in 18&quot;, 2', and 3' widths, and they are 1-1/2&quot; deep from front to back. What if we cut the ventilated shelves? What size Stabilization Kit do I need? If I choose to cut the 3' shelves to 29&quot;, what size Stabilization Kit do I need to get, the 3'? Or is cutting the ventilated shelves only meant for wall-mounted solutions? You are correct. The freestanding solutions come in fixed widths of 18&quot;, 24&quot;, and 36&quot; wide solutions. Cutting shelves to size would be for the wall-mounted solutions. 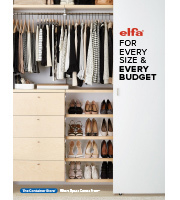 Would the 36&quot; width kit support heavier coats and suits hung on an elfa closet rod and 2 freestanding uprights? A 36'' wide solution will support your needs. If you have any additional questions, or if you would like a custom design, please contact our customer solutions department. You can also LiveChat with us.